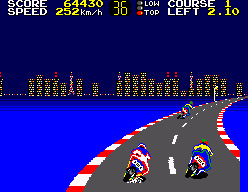 Hang On is a bike racing game that was first released in the Arcades in 1985. It features eight levels and the objective is to avoid other bikers, hit five checkpoints against the clock and reach the finish line. 60 seconds are available per section, although any remaining time is automatically added to your total once you pass a checkpoint. Button 2 accelerates, Button 1 brakes, and the d-pad Up/Down directions are used for changing between three gears. Your super responsive bike is incredibly nimble, and it's thrilling to speed around a corner, depress the accelerator and effortlessly glide between two fellow riders. The sense of speed is blistering too, and features some impressive scaling on the straights. One of the game's best features is how your bike continues its momentum, even after time runs out; this results in some excruciatingly tense moments where it limps towards the checkpoint! It's always satisfying when it crosses over the line and the game continues, and I really like how the remaining distance is displayed in the top-right to aide with building up this intensity. Stockpiling as many seconds as possible on each section is crucial (basically acting as a buffer zone later in the race) and this fun mechanic is almost a game in itself right from the start! The track layout is great, and the seamless transition between locales (e.g. nighttime city, desert) is a motivating feature that reminds me of Turbo (1981, Arcades). The game does have a few minor issues, mainly the inconsistent collision detection, and the mushy Master System d-pad that can result in the accidental lowering of your gears. Also, there's only eight courses with barely any increase in challenge. Hang On is a terrific racer that blends enjoyable course design with smooth controls and tense gameplay. It does have some replayability issues due to its lack of tracks and difficulty, but that won't stop you from having a blast during your time with the game. Random trivia: In North America, the game was released as part of a combination cartridge with either Safari Hunt (1986) or Astro Warrior (1986).